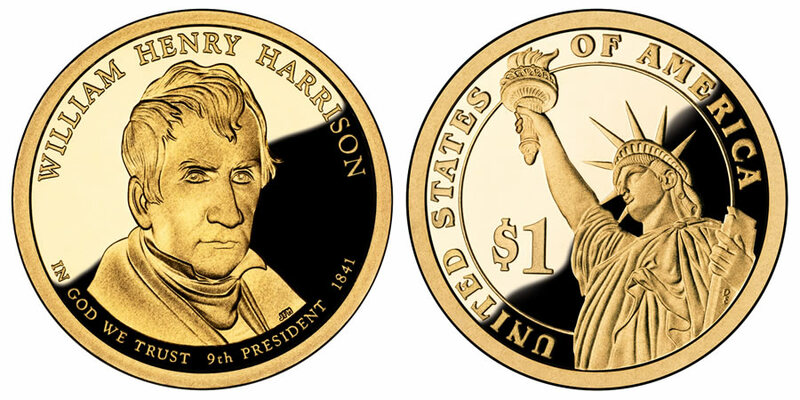 Celebrating the shortest tenure of any President of the United States, the US Mint has released the William Henry Harrison Presidential $1 Coin. While Harrison only served as President for 32 days before his death, his service to the country before that was long and distinguished. Coming from a well-known family (his father Benjamin Harrison signed the Declaration of Independence) did not stop William from making a name for himself. A distinguished career in the Army was followed by several political appointments including secretary of the Northwest Territory, Governor of the Indiana Territory, Ohio State Senator and minister to Columbia. Known as "old Tippecanoe", a nickname he earned defeating the American Indians led by Shawnee chief Tecumseh at the Battle of Tippecanoe and the Battle of the Thames, he would use the the campaign slogan "Tippecanoe and Tyler too" to successfully defeat the incumbent President Martin Van Buren. This campaign slogan is still one of the most remembered to this day. William Henry Harrison's portrait (designed by Joseph Menna) is centered on the obverse. Over his head is his name "WILLIAM HENRY HARRISON" and underneath him "9TH PRESIDENT" and "1841". Also, marking a change from previous Presidential Coins in the series, the words "IN GOD WE TRUST" are now placed on the obverse, instead of the less prominent edge, as it had been before. The Statue of Liberty is featured on the reverse of the Harrison Presidential $1 Coin. Circling the edge is "UNITED STATES OF AMERICA" and "$1" is shown to the left of the image. It was designed by Don Everhart.